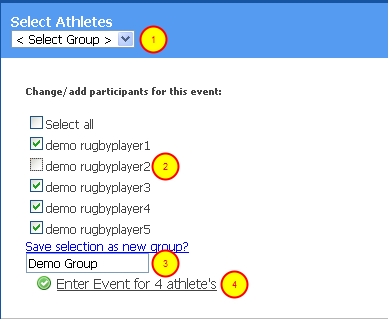 When you want to enter data for more than one athlete use the Group Entry Module. Select the "Enter Data For Group" button displayed in the image above. All of the forms that you have access to, and any new forms that your sport/organisation monitor will all be available using the "Enter Data For Group" button on the Home Page. Select the Type of Information You Need to Enter (this is the same page as when you enter for a single athlete). 3. You can also select to be shown a subgroup of forms. The example here again shows the "Jumping" Link from the Testing forms has been selected which then shows all of the jumping Fitness Testing Forms. 4. For this example we will select "One-Step Vertical Jump Test"
Is there a Table in your Event/Form? If there is a table included as part of the Event/Form you will need to specify the number of rows you want to enter for that table. See Entering into a Form with a Table in this section. Now select the date that you want the event to be stored on the systems. The Date and time that you enter the information will appear as they default date and time. To choose a different date, click in the "Default Date" Text box and a pop up calendar will appear (as shown here). Click on a different date, or scroll through months using the < and > arrows, then click on your date. Once you select a date, the calendar will disappear and you can select a start time and a finish time. The Image here shows that the entry is being entered on the 6-10-2009 at 5:15pm. Now start to enter your data into the Table by clicking in a cell and entering the correct information. Use the arrows on your key board to move between cells, or click in a cell using your mouse and you will be able to enter information directly into that cell. Any table that you need to enter data into may be made up of any kind of question (single selection, drop down, text box, number, database). When you enter data into a table, simply click in the first cell of the table. A pop up box appears allowing you to enter data for that specific cell. A blue header appears above each cell that you click on and it specifies what data is being captured and for what athlete. This ensures you always know who you are entering data for. Because you are entering data on-line it works slightly differently than an excel spreadsheet, so you need to work from one cell to the next. Simply enter your information and click Done. To speed up data entry, the system will automatically take you to the next cell to enter your information. You can use the enter, tab and up and down arrow keys on your keyboard to navigate around the table cells. Fill Down- allows you to select to fill down the entire column (or even all of the rows) with the same data. See the Fill Down step below. Copy Last- will copy the cell above into this cell. Paste From Excel- allows you to copy in data from an excel spreadsheet, as long as it is formatted in exactly the same format as the table columns. Click Paste and a blank pop up box appears. Copy the information from an excel spreadsheet directly into this window and click "Insert Values". To speed up data entry in the table, when you click on the "Done" button after you enter information into a cell, you can specify whether you want to automatically move to the cell to the right, or underneath, or you can specify that no cell automatically opens. This allows you to mimic the way you enter data. Next cell is right for entering across a row. Alternatively, if you are going to different cells in the table, you may want No next cell to pop up. This means any calculations will instantly occur when you are entering data into the table. If you have a very large amount of data to enter, you can turn off the recalculate Instantly to help speed up data entry. All/any calculations will be performed when you click Save. Fill Down allows you copy any combination of data that you have entered into a column and fill the rest of the tables with this information. When you select "Fill Down" a pop up box will appear asking you to clarify what is being filled down e.g. copy rows 1-1 and fill down rows 2-5. This will take the data from the column in row 1 to row 1, and fill down that information into rows 2-5. If the "Overwrite existing data" is selected, you WILL overwrite any data that is currently in any cell that you are fill down over. If you click in the "Copy entire rows" (as shown above), this will copy all of the information along the first row, and overwrite over all of rows 2 to 5. ONLY use this option only when you need to have the same type of data going into all rows (not just one column!!). If you look in the image in the previous step, the "Copy entire rows" has actually been used on a MFST Form to completed generic testing information, before the actual athlete results are entered. Save and Close: to save the information and close entry page. You will then be taken to the reports page to compare the data against other records. For this example, we are going to save and close the event. You will then be taken to the reports page to review the data, compare it to relevant performance standards, or compare it to previously entered records. When you enter data for a group of athletes, you can choose to edit or view that data in group mode again. This saves a significant amount of time. If data has been entered in group mode, and you want to edit/review that event, simply click on that event in the Calendar, My Schedule or Reports page using any athlete's name who was in that specific event. You will then be able to edit it for that individual athlete, or for the entire group. The example in the image above shows that a sit up test was entered in group mode. Demo Sam's Sit Up event was selected on the Reports page and then we could select to edit the event (e.g. open the event) just for demo Sam, or to open the event in group mode (Table mode) again. One of the best features of the system is that when you enter data for a group of athletes, each individual record is saved individually under the athlete's name. This means even when you enter data for a group, when an athlete logs in on their athlete login, they will only be able to see their personal information. When you select a Form/event that has a table in it (e.g. a Strength and Conditioning Form) you will be asked how many rows of data you want to enter as part of the table. For example, how many Exercises you want to enter for each athlete for a strength and conditioning session, or how many Medications you want to enter for a Medications Form. Click on the Number that corresponds with the number of rows of data you want to enter. For this example we are going to enter 2 exercises. The Table above shows that 2 rows are now available for each athlete to add exercise data into. 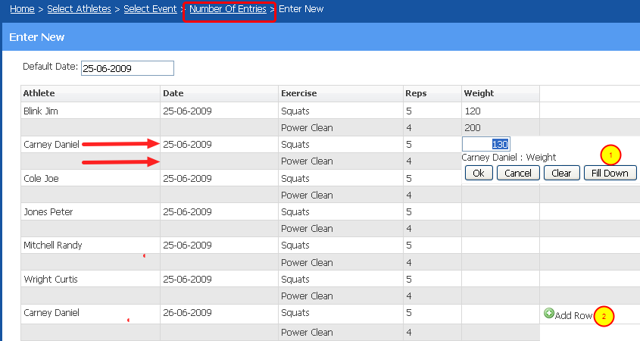 If you needed to add in 3 rows of Exercise Data, click on the Number of Entries Link highlighted above and choose 3. This allows you to repeat the Reps, or Exercise that you need to instantly fill the rows of data with exercises or reps (as shown here with Power Cleans and Squats and the number of repetitions). To do this you need to select the last cell in the series that you want to repeat, You would then choose to copy the data from rows 1 to row 2 and copy to rows 3 to 10. See the Fill Down step discussed previously. The green Add Row button allows you to add in additional rows at the bottom of the table. Complete the Data and Remember to Save it!